'HUNG UP ON YOU' No#1 on CMC! 'Hung Up on You' has achieved far more than expected, not only with a No#1 on Australian radio, and a Golden Guitar Nomination, but now a No#1 on The Country Music Channel (CMC) for the music video. Troy Kemp and Jayne are over the moon and so grateful to all the fans and industry who continue to share the love. You can see Troy and Jayne performing this song and more together at many shows throughout the year. Jayne's also thrilled to announce she'll be heading to the USA to perform at the "Mid America Truckin' Show" (MATS) at the end of March. 2019 is unfolding to be a huge of touring including 8 music festivals already locked in. Be sure to check out the DATES page for more information, or subscribe to the newsletter to keep up to date with Jayne. 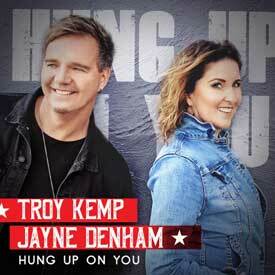 All in one week Jayne & Troys Brand new single 'HUNG UP ON YOU' went to No #1 on the Kix Country Chart and they were Nominated for a Golden Guitar for Vocal Collaboration of the year. Plus the Brand new video clip for the song was 'Country Pick' of the week on CMC and is now racing up the Charts. Jayne and Troy are planning to do some shows together in 2019 and look forward to the Tamworth Country Music festival where they will hit the red carpet for the big night of nights. It came out of the gate faster than a race horse, reaching #16 on the iTunes singles charts already, and hit 20,000 streams in 4 days. It also entered the 'KIX Country' Charts at #13 within days of the release. It is out now on all digital platforms, so go check it out. The video clip is in edit and will be out shortly. Jayne only just finished writing this lil party starter with Award winning writer producer duo the Banton Brothers four short weeks ago. She knew instantly that this song was going to be dubbed as the 'Girls Night Anthem' and had to be her next single. 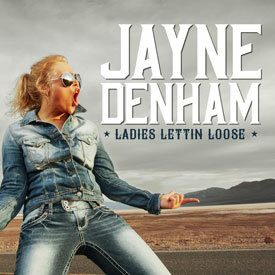 Jayne started recording 'Ladies Lettin Loose' immediately so it could be released and performed at this years Gympie Muster & it sure was a hit. The new 'Calamity' album is having great success especially on Spotify with the listeners reaching 23,000. The song 'Black Coffee and White Lines' is proving to be popular with over 90,000 streams in 8 weeks. The New album Calamity is out NOW landing #4 on iTunes, #6 on Aussie Artist Aria Charts. 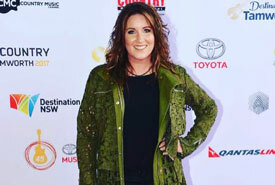 The album debut came the same weekend Jayne played an incredible night at CMC Rocks. Not slowing down, Jayne then headed back to perform at a SOLD OUT crowd in Springwood to start her Album Launch Tour. 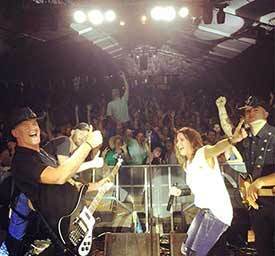 It was a HOT week at The Tamworth CMF but Jayne's shows were packed out! 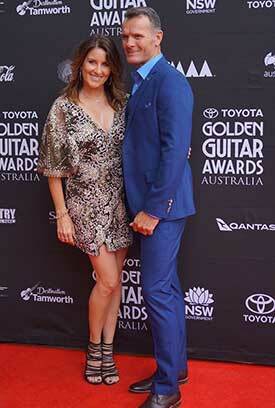 She and her husband Dave strolled the Red Carpet and were looking amazing at the Golden Guitar Awards. Congratulations to all the winners. The new video clip for CALAMITY is out now on YouTube, VEVO and The Country Music Channel. The video was produced by Paul Denham and you will see a lot of Motor Bike action in this clip. Jayne and the team had a blast making this video. January 16 2018 - Excited to announce Jayne’s new album CALAMITY will be out 16th March 2018. Recorded in Nashville with Producer Brian White at Jay DeMarcus’s (Rascal Flatts) studio with the best musicians in town including Jay DeMarcus on bass guitar. The first single STACKS continues to climb up the CMC top 30 charts and hit No4 on Australian Country Tracks top 40. Her next single CALAMITY will be hitting the airwaves in February followed by a high energy video clip. The CALAMITY 1st Tour dates are announced and tickets are on sale so check out a show that's in a town near you. 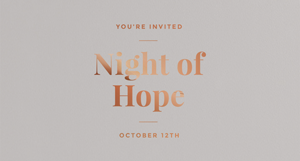 Thursday, 12 Oct 2017 7:00 PM AEDT - Jayne will be joining Mark & Darlene Zschech for the first ever Night of Hope as they come together to bring hope and strong community to those living with cancer as well as their friends and families. Their aim is to do all they can to support those in our world going through these very tough seasons. To raise funds, bring joy, and to let them know they are not alone. This will be an exquisite evening of amazing musical guests, food, and silent auctions with all funds raised going to CoastCanCare, an incredible support organisation on the Central Coast. 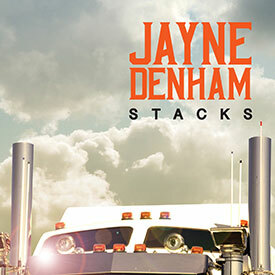 The woman of country rock, Jayne Denham, has released her much-anticipated new single, Stacks. Stacks is the first single lifted from Jayne’s forthcoming EP slated for release in early 2018, and was co-written by Jayne, Phil Barton and ACM nominated songwriter, Brian White, who also produced the track, which was recorded at Jay DeMarcus (Rascal Flatts) studio in Nashville with Jay playing bass. The EP features a mix of country rock and ballads. The new single, Stacks is available now on iTunes, Spotify and Google Play. 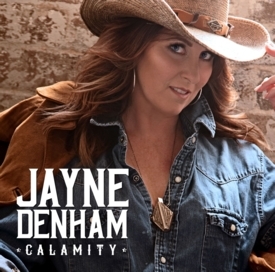 Jayne packed out each night with her NEW show “Jayne Denham Presents: Women That Rock” featuring songs from artists like Miranda Lambert, Carrie Underwood, Joan Jet, Jayne’s #1 songs, as well as brand new songs she has been writing in Nashville. She performed an unplugged and intimate show sharing the stories behind the songs. 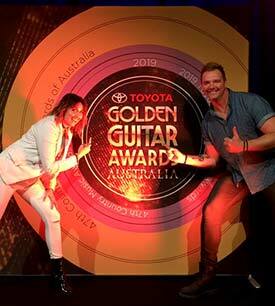 She rocked the Red Carpet for the CMAA Golden Guitar Awards and celebrated her 10th year coming to the Festival. Jayne was honoured to be the Ambassador for the Brisbane Convoy for Kids again this year. She had the privilege of being the first artist to perform to families at The Humming Bird House in Chermside. Money raised from this year's Convoy event were donated to this organization, which is the only children's hospice in Queensland. 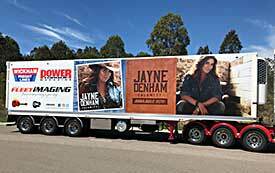 Thanks to Wickham Freight Lines for bringing the Jayne Denham trailer and Scuzztrans & the Ned Kelly truck for helping Jayne start the show. Jayne is honoured to announce she is now the Ambassador for Burrumbuttock Hay Runners. The next convoy is going to be huge, with more than 200 trucks attending. Ned (The Truck), Jayne and all the trucks loaded with hay will arrive at IIfracombe in Qld on April 1. Then, on Saturday April 2 after all the hay has been shared around to our Aussie farmers, Jayne & the band will put on a show like no other. 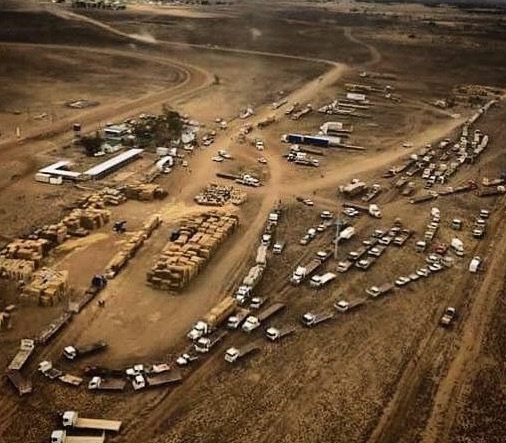 To give generously in helping cover all the truck fuel costs please visit the Burrumbuttock Hay Runners Facebook Page. 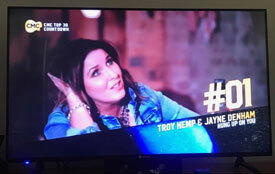 Jayne's latest single "Grew up Round Trucks" (Skuzztrans version) video clip has reached No 8 on CMC (Country Music Channel) and no 6 on the Australian Country Music Radio Charts. A big thanks to CMC, Australian Country Radio and all the fans for requesting the song! 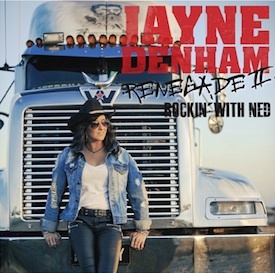 NEW DIGITAL EP "RENEGADE II: ROCKIN' WITH NED"
Jayne is pleased to announce the launch of her new Digital EP: "Renegade II Rockin' With Ned", through ABC Music/Universal. The EP is released today across digital partners. This is the next chapter in Jayne's music career and contains additional material not released on her previous album, Renegade. Launching the EP is her latest single "Grew Up Round Trucks (Scuzztrans Version)". Recorded with legendary producer Garth Porter at his Rancom Studio in Sydney, "Grew Up Round Trucks" is an ode to the families of truckers who keep this country moving. As Jayne explains, "Touring around Australia, I often perform at trucking events and have noticed how it really is a generational career. 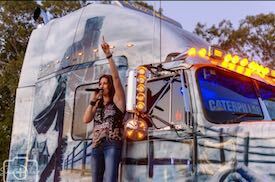 The song means a lot to me because I see how the passion for trucking has been passed on through my own family and I can see that in my audience too"
To support the release, Jayne will also be hitting the road with a round of tour dates. Accompanying her on these shows will be the legendary truck "Ned": a star amongst the trucking community and referenced in the EP title, "Renegade II Rockin' with Ned". Watch the new video for "Grew Up Round Trucks". Country music star Jayne Denham is proud to announce her partnership with renowned transport company Scuzztrans. The Queensland based business who specialise in transporting shipping containers are also well known for their award winning flagship Western Star truck 'NED'. This head turner is a symptom of Scuzzy's passion for trucks and his transport business. It's this combined passion which brought Jayne and the Scuzztrans team together. "I was thinking about doing a new truckin' song release when (Scuzzy) Andrew McSweeney and his wife Helen came to me with an offer to partner together and sponsor me so I could get the wheels back on the road after taking time out", says Jayne. Without giving too much away till all is launched shortly, there will be new songs, a hot new video clip featuring the "NED KELLY" truck, plus lots more exciting announcements to come just around the corner. With a motto like 'You care so we care', Scuzztrans owners Helen and Andrew (Skuzzy) McSweeny were looking to make an impact in the transport industry and Jayne was the perfect match for their campaign, "The Scuzztrans team feel very proud and honoured to be given the opportunity to work with Jayne Denham in the next chapter of her music career", says Andrew & Helen McSweeny. With existing sponsorship from Wickham Freight Lines, Jayne's passion for the people who keep our country moving is more ignited than ever. "I have been very blessed to have Wickham freight lines as a major sponsor and to be working with yet another top shelf company like Scuzztrans, I couldn't be happier', says Jayne. So keep an eye on this highway because Jayne Denham is back & if you think she was 'Renegade' before, you ain't seen nothing yet! 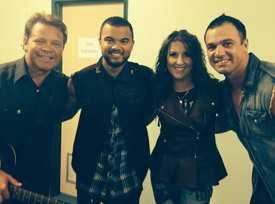 For the first time since Australian Idol in 2003 Guy Sebastian & Shannon Noll have performed a show together. Jayne was Shannon's special guest, performing their No1 and Golden Guitar nominated song "Beyond These City Lights'. Troy Cassar-Daley was Guy's special guest. It certainly was a night to remember. Fill in your email address below to receive regular email updates from Jayne.